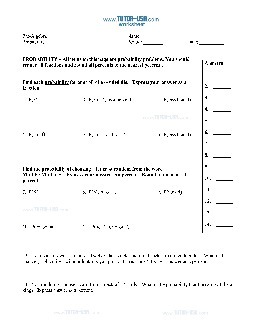 This worksheet contains a number of problems on calculating probability and odds of different events. Problems include calculating probability, odds for and against an event, and open-ended questions that require the use of probability and odds to solve. 6. To find probability and odds for and against certain events. Find each probability for one roll of a 6-sided die. Express your answer as a fraction. Express your answer as a percent. Round to the nearest percent. 13. Your sock drawer is a mess. Twelve black socks and 6 red socks are mixed together. What is the chance (probability), without looking, you pick out a red sock? Express answer as a percent. ODDS. The following items are problems involving odds. A teacher chooses a student at random from a class made up of 10 boys and 15 girls. Find the odds in favor of each event. 27. Your friend is tossing a coin. He says that heads and tails are equally likely outcomes, so the probability is 50/50. Explain your friends error.